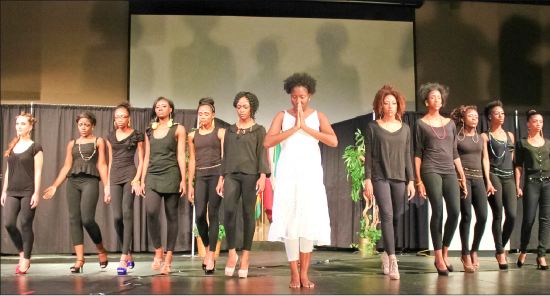 Liberty University’s Association of Students of African Descent hosted their annual fashion show, Strike a Pose, Africa! this past Saturday to raise awareness of HIV/AIDS. The show was geared in a way so that students could be informed of the impact that HIV/AIDS has on the world around them. It also exposed the students to various African foods, dialects, clothing and cultures. “I want this to really inform people that have a general knowledge about Africa but don’t really know the heart of Africa,” fashion coordinator Kay Jones said. The fashion show included clothing representing countries such as Nigeria, Tanzania, Ghana and many others. Over 30 models participated, showcasing outfits provided through many of Liberty’s international students along with donations from Stanley Stewart Clothing, according to Jones. HIV survivor Marvelyn Brown addressed the group of students halfway through the show, briefly explaining the impact that the disease has on the world. Brown shared parts of her own story of her struggle with being HIV-positive, giving the students a closer look at the difficulties that so many individuals face. The evening closed with an opportunity for students to experience some of the different types of African food. Jones is pleased with the turnout this year and is already looking forward to next year’s show. “It gets bigger and better every year,” Jones said. “I really want the audience to grasp the full understanding of what it means to be African, from the struggles to the strengths,” Jones said. “This show embodies the heart of Africa,” Jones said.